Our understanding of the sciences has a tremendous Western bias. The study of our planet, the stars, and the laws of physics and nature is almost always told linearly. Thought and ideas are believed to move forward chronologically and geographically from the Ancient Near East and Hellenistic World (Egypt, Persia, Greece) to Imperial Rome to Renaissance Europe to Enlightened Britain and France and the Industrial Era to the age of American technology. Most people are blind to scientific developments that happened elsewhere in the world. Dr. Rossana Quiroz Ennis, of the Institute for Prehispanic Astronomy at Canada de la Virgen (https://en.wikipedia.org/wiki/Cañada_de_la_Virgen), has dedicated her career to the study of pre-colonial astronomy in Central Mexico. Her archaeoastronomical studies at the Otomi pyramids outside of San Miguel de Allende tell an astounding story. As most of Europe was fumbling through the Middle Ages at the turn of the second millennium (circa 1000 CE), the Otomi Toltecs were thriving in a society dedicated to the stars. Dr. Quiroz Ennis spent years photographing the alignment of the moon, sun, and other celestial bodies in relation to the structures at the Canada de la Virgen site in the Mexican state of Guanajauto. She combined traditional archaeological methods with astronomical charts and computational analysis to determine the Otomi’s understanding of the night sky. Through her research, she discovered that their society were able to accurately predict solar and lunar eclipses using the alignment of the main pyramid with the paths of the sun and moon. The fact that that this achievement was underway some 850 years prior to equations of William Chauvenet and Friederich Bessel in Germany (the basis of modern day eclipse calculation) is truly astounding — a real testament to the scientific tradition and strength of non-European cultures. 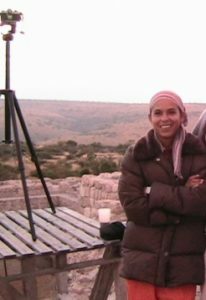 We here at Data Vortex solute the work of Dr. Quiroz Ennis and others like her whose discoveries are paving the way for the inclusion of non-Western intellectualism in the narrative of human history and inquiry. Below is an interview with Dr. Quiroz Ennis with Joel Aaronson of the Carnegie Museum of Natural History in Pittsburgh, PA.